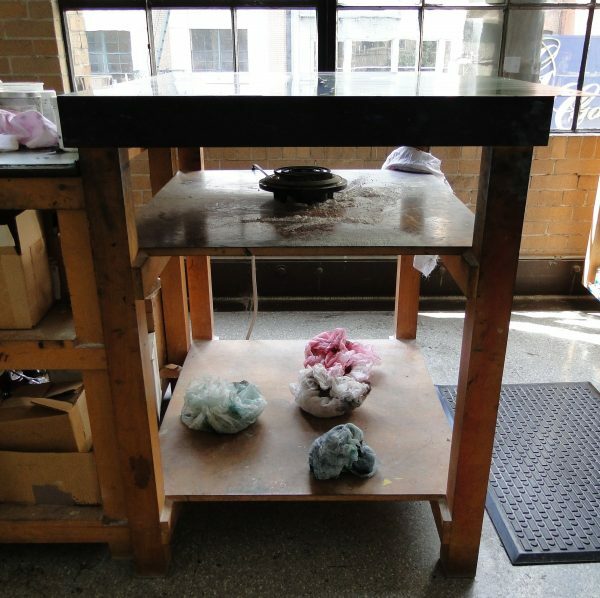 At Crown Point Press we ink and wipe our plates on a tall, heated stand. Our inking stand is about waist high and has a copper working surface that is lightly heated by a single hotplate burner. Working at an ergonomic station can really improve the quality of your prints, as you’re able to work very sensitively with your plate. If you’re inking and wiping your plate on a standard, low table you’re forced to hunch over in order to get a good look at your plate. Working on a low surface also makes it easy to exert too much pressure with your tarlatan and take too much ink out of the plate. When you’re working with your plate it’s best if you’re standing up completely straight. You’ll be surprised how easy and natural it feels to work in this way. It is especially beneficial for hand wiping. When you’re able to hand wipe with your elbow just slightly bent you’ll find that there is much more finesse and ease to your stroke. A heated surface also makes a huge difference. The top of our table is copper, though any metal surface will do. For our tabletops, we’ve used cancelled plates from our artist’s projects. On a shelf below the inking surface we place an ordinary electric hotplate burner, set at medium low. This creates a pleasantly warm surface. If you can’t keep your hand on the surface without feeling like you’ll burn yourself, it’s too hot. This heated surface allows the ink to transfer smoothly and loosens it up a bit for tarlataning and hand wiping. You can use these specifications to make an inking table just like ours or modify them to suit your studio set-up. Your primary goal is to get the inking table at a good height for you and to give it a little heat. I’ve heard of other inventive twists on our concept. In a school where the hotline plate burner creates too much fire risk, a high-watt light bulb was used in its place. I’ve also heard of someone using a heating pad directly below the metal inking surface. A fellow who took our workshops made several great inking tables based on ours but with surfaces about one-third the size. He put them on locking casters so they could be easily moved around in a smaller studio. Our inking tables measure 42-inches high. Your inking table should be about waist high. We’ve found that this height suits most people but you can modify it to suit your needs. Be sure your back is straight when you are using it. This size works well for our 36 x 45″ plates but your stand could be whatever size best suits your space and the general size of your work. Burner Shelf: 12″ down from the top surface. Place the burner in the middle the platform. You can drill a large hole in the center to run the plug through if you like. We also put our chalk (for hand wiping) on this shelf. Bottom Shelf: 7″ off the floor. This shelf is handy for storing the tarlatans you’re working with. Crown Point Senior Master Printer Emily York demonstrating how to stand when inking a plate. Crown Point Senior Master Printer Emily York demonstrating how to stand when hand wiping a plate. The copper top of our table in the Crown Point studio.